Originally published in the Informanté newspaper on Thursday, 2 August, 2018. Every few months, the World Economic Studies Division of the Research Department at the International Monetary Fund in Washington DC takes a look at the world economy, and provides us with a projection going forward. 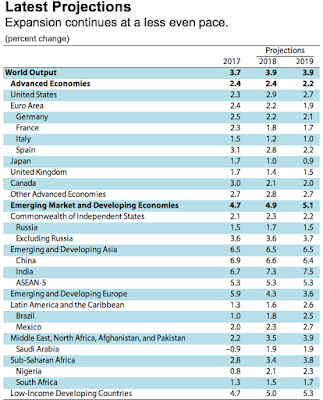 During July, they released an update to their World Economic Outlook to give us a glimpse into what might lie ahead. So what does the July 2018 report reveal? Well, global economic activity seems to have become less synchronized, as economic expansion has become uneven. Although the growth forecast for 2018 and 2019 has remained unchanged 3.9%, risks have significantly increased, as a result of tariff increases by the United States, and the resulting retaliatory measures are raising uncertainty and will impact investment. So while financial market conditions remain in line with future growth projections, these actions could trigger tighter conditions, potentially signalling portfolio adjustments and sharp exchange rate movements that could reduce capital inflows to emerging markets. Let’s start digging into the details, starting with the so-termed ‘Advanced Economies.’ In the United States, economic momentum will carry forward, with growth projected at 2.9% in 2018 and 2.7% in 2019. However, with significant financial stimulus reducing unemployment, inflation will be stimulated, along with domestic demand, exacerbating global trade imbalances. In the Euro area, growth is projected to slow gradually from 2.2% in 2018 to 1.9% in 2019, with France and Germany having slowed more than expected, and Italy experiencing tighter financial conditions due to political uncertainty. Japan, however, has seen its 2018 growth downgraded to 1.0% and that of 2019 to 0.9%, due to weak private consumption and investment, as the country’s shrinking labour force continues to curtail growth. Now let’s have a look at the Emerging Market Economies. First amongst these is of course China, with growth of 6.6% expected in 2018, and slowing to 6.4% in 2019, as external demand reduces and regulations in its financial sector takes hold. In the rest of Asia, the economies are doing quite well too, with India in particular picking up, with growth for 2018 expected to be 7.3% before increasing to 7.5% in 2019, as the country recovers from its currency exchange initiative and the impact of its goods and services tax gets internalised. However, the effects of higher oil prices are already curtailing growth in the region as it anticipates inflationary pressures, resulting in a tighter monetary policy. In developing Europe, growth has been moderating to 4.3% in 2018, and further down to 3.6% in 2019, as financial conditions tighten for countries with a large deficit. In particular, Turkey is set to see its growth face from 7.4% in 2017 to only 4.2% in 2018. In Latin America and the Caribbean, GDP growth increasing, with growth expected to be 1.6% in 2018, and increasing to 2.6% in 2019. Mexico continues to face trade tensions with the US in the NAFTA trade renegotiations, while Brazil is still in recovery from strikes and political uncertainty. Venezuela is the region’s Achilles heel, as it continues to experience a rather significant collapse in economic activity, and faces a humanitarian crisis, despite the increase in oil prices, as it cannot sustain even its current oil production. In the Middle-East and North African region, oil producing countries have benefited from the increase in oil prices, but oil importing countries still remain delicate, as geopolitical conflict still embroils the region. Nevertheless, growth is expected to strengthen to 3.5% in 2018, and continue upwards to 3.9% in 2019. In the Commonwealth of Independent States (or Russia and the former USSR countries) conditions have stabilized, with growth in 2018 projected to be 2.3%, and forecasted to drop to 2.2% during 2019. This coincides with Russia emerging from its recession, with expected growth of 1.7% in 2018, and 1.5% in 2019, with the rise in oil prices counteracting the effect of sanctions. Finally, our own neck of the woods – sub-Saharan Africa. By now we have good comparisons with the rest of the world to show just how we’re doing. Well, the region as a whole is expected to continue to recover, with growth for 2018 forecasted at 3.4%, and increasing to 3.8% in 2019. Nigeria’s recovery due to the increase in oil prices is quite strong, with 2018 expected to be 2.1%, and increasing to 2.3% in 2019. South Africa, the region’s other large economy, was expected to recover somewhat during 2018 despite a weak first quarter due to new leadership inspiring private investment. Unfortunately, the news of land expropriation without compensation set to be included in the country’s constitution is unlikely to be met with much applause from foreign investors. So what does this mean for us? When we take a step back to see the whole world economy at a glance, we can see that no region is without its challenges. We are still struggling to recover from our own economic recession, but if these countries show us anything, it is that there is a way forward. There is a light in the darkness. There is but one trick to it, however – we must supply our own light. Chief Analytics Officer / Head: Group IT of Trustco Group Holdings Ltd.